The RM of Sherwood uses the Saskatchewan Assessment Management Agency (SAMA) to calculate and update all assessments within the municipality. SAMA performs annual maintenance updates to properties showing an increase or decrease in assessment. The provincial government mandates SAMA to conduct periodic revaluations of all Saskatchewan properties every four years to coincide with the change to a new base date. A full revaluation of all properties was completed province wide in 2017 using a 2015 base date. Provincial legislation requires municipalities to use these values when determining tax amounts for a property. SAMAView is an on-line search tool that allows general public access to property assessment information in municipalities where assessment services are provided by SAMA. The SAMA website is a useful resource that provides more detailed information on property assessment in Saskatchewan. Any person with an interest in the assessed value or classification of property can appeal the property assessment. 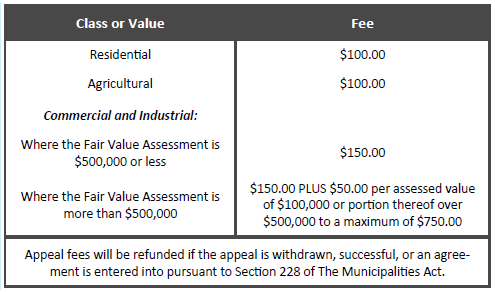 The Assessment Appeals Guide in Saskatchewan For Citizens guide explains the property assessment appeal process. Appeal Forms must be fully completed and include payment of the Appeal Fee. SAMA has been mandated the responsibility for determining assessment values for all properties, while the task of setting property taxes belongs to municipal governments. SAMA first determines the assessed value for the property. After that, a provincial government tax policy is applied. 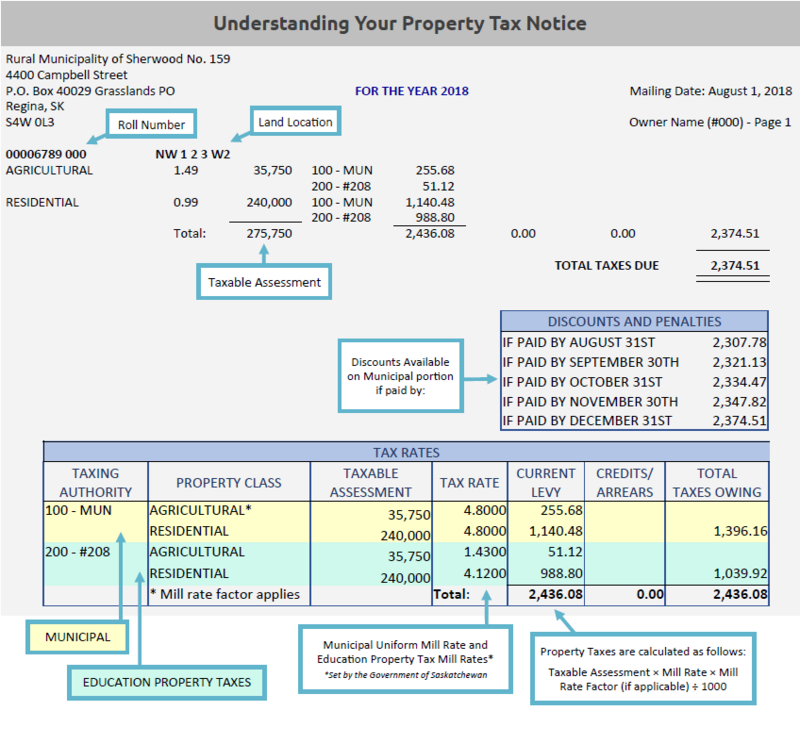 The policy multiplies a percentage formula against the assessed value, producing what is called the taxable value. A municipality may use mill rate factors to transfer some of the cost of public services from one property classification to another. All property in a municipality is classified as agricultural, residential or commercial / industrial. Mill rate factors essentially adjust the mill rate, with the result that the effective mill rate for a specific property classification may be higher or lower than other property classifications. As of January 1, 2013, municipalities cannot apply discounts or incentives to education property tax. The deadline for payment of taxes is December 31st. Payments are processed and the applicable discount applied according to the date payment is received. Late payment penalties are added each month to property taxes that remain unpaid as of December 31st of each year, at the rate of 1.0% per month or 12.0% per annum. If you occupy a dwelling in the RM of Sherwood, you may qualify for an exemption to reduce all or a portion of the taxable assessment on your principal dwelling, as per section 293 of The Municipalities Act. Dwellings located within hamlets are excluded. 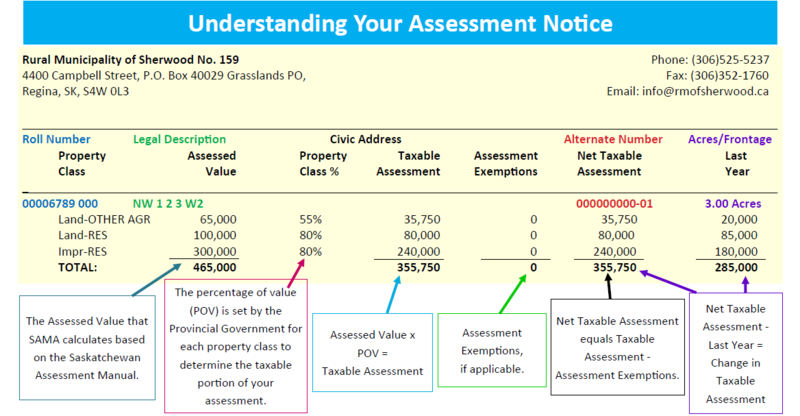 The total taxable assessment of any agricultural land you own or lease located within the RM of Sherwood or in adjoining Saskatchewan rural municipalities will be applied to reduce your residential taxable assessment. An assessment can only be used to reduce residential taxable assessment once. An affidavit listing land owned or leased within the municipality or adjoining municipalities must be completed and returned to the assessor prior to March 31 of the tax year to receive the exemption.